Bart Pasquale, who last appeared on these pages with his insightful comments on the Sony Alpha Full Fame – Antishake question, is back with a detailed analysis of the Sony battery for the A700 Alpha and it’s lack of compatibility with the A100 batteries. Here’s some info regarding the new Alpha A700 battery, the NP-FM500H. As you may know, there is a grove in the new battery, and a ridge in the A700 battery compartment, which prevents interchangeability with the A100 battery. I contacted my usual 3rd-party battery suppler from eBay, and he said Sony has blocked the manufacturing of NP-FM500H compatibles. It was not clear weather this is legal/political maneuvering, or simply an issue being able to reproduce the circuitry required for A700 to display the % charge remaining, but he expected something out of Taiwan by January. What he did know is that one person reported to him filing out the ridge inside their A700, and the A100 batteries did NOT power the A700. 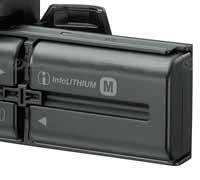 A700 battery shown being loaded into new vertical grip. Notice the groove that allows battery to fit the A700 compartment. Straight shooting without reviewing images can achieve 30+ frames per percent at any phase in the charge cycle. Once the battery indicates zero charge, you can still quickly eek out a few hundred shots! This is about an extra 12% of charge not indicated in the charge level. During recharge, the first 15 minutes were spent to achieve 1% charge status back. After that, it was pretty linear, adding about 12% every 15 minutes achieving 86% after 2 hours of charging. The battery indicated “100%” about 35 minutes later, but continued to take a charge for an additional 15 minutes to top it off. So, one could theoretically shoot 400 frames, recharge for 15 minutes while the model changes, and never run out of charge. Of course, YMMV; I don’t know how consistent one battery will be to the next. Happy shooting all! Wow, that is a pretty exhaustive (no pun intended) sample of the battery life of the NP-FM500H when used in the A700. I found it interesting that someone would actually go as far as removing the locking ridge from a new A700 to try to use the older battery. The fact that the NP-FM55H (used in the A100) would not power the A700 indicates to me that the ridge serves a purpose beyond an attempt to sell more batteries. It’s easy to point to an incompatibility like this and suggest it is being done to sell more batteries. I’ve found that manufacturers rarely make components less compatible just to move additional product. They have to stock additional components, manufacture additional components and distribute two lines of batteries instead of one. Usually is in the company’s best interest to stock and sell as many common items as they can, because that drives manufacturing and stocking cost down. That said, several printer manufactures have taken great pains to make sure only their own cartridges work with their hardware. So who knows? This could be Sony’s attempt to eliminate after-market battery competition, but I doubt it. Usually when an electronic product carries a lock out ridge like the one described above, it is to prevent using a non-compatible item that might cause damage to the devise. The upshot is A100 batteries are NOT compatible with the A700 — don’t try to reengineer the camera or battery in attempt to make them work. It Bert’s tests are indicative of how long a typical NP-FM500H will last, it seems like for most shooters a single battery will cover most assignments. A second battery, either used as a spare or inserted in the A700 Vertical grip should be more then sufficient power for most A700 shooters. Thanks again Bert, this is a great report. If anyone is interested in Bert’s A100 gear, email me and I will get you in touch. This entry was posted in DSLR, Sony A700, Sony Alpha, Sony DSLR. Bookmark the permalink. Post a comment or leave a trackback: Trackback URL. Is that 3080 images on two batteries? Either way that is WAY more images than I can blow off on my A100. Nice experiment, for me it’s very interesting, I’m still waiting my A700. Some people reviewed similar results, but therefore what is CIPA standart test method if it drain a battery with 600 shoots? Ordered my camera on line, should be here tomorrow. Before shipping, I received a call strongly suggesting I should buy another battery at the disounted price of $179. Had the price not been so outrageous, I probably would have fallen for it. Thank you for your article and investigation. I did agree to a 3 year extended warranty covering parts and labor, and yearly cleaning on the A700. Hopefully I wasn’t taken on that!! Just when I thought I had found a reliable vendor!! I just finished a photo shoot of a ballet rehearsal with my A700. I shot xfine JPEGs, no flash, stage lights only, with the Sony 70-200 G lens. After close to 500 shots my battery was showing about 30% left. I was impressed by this performance but it is nowhere near the results you’ve gotten. I was reviewing quite a few pics as I went along but deleted very few. Could it be the big telephoto lens? Sidebar: Comparing my results with recent session using Canon 5D with 70-200 L lens, exact same venue, and I am very pleased with the Alpha — as good or better I would say. I love my a700, after about 7000 photos I find it works very good for my work of recording construct work in the desert of Saudi Arabia. The dust resist is good, caned air is used. I can shoot all day, find little difference in turning off the switch, let it go to sleep with lens cap on. Hi, how can I get in touch with Bert Pasquale – I’m interested with the A100. Pls PM me with his email? Thanks! It’s virtually 100% certain that the the reason the A700 won’t accept anything but batteries with the Infolithium circuitry is so that Sony can have a much stronger hold on the battery after market. My evidence? Well a few things – firstly Sony is known for pushing their own proprietary technology – I have a Sony camcorder, but it doesn’t have a standard socket for an external microphone., just a special Sony one. A second example is the hand grip for the A700 – Nikon’s comes with the facility to use AA batteries; useful in an emergency. Sony’s A700 handgrip doesn’t. As far as the pure technical stuff goes, the Infolithium battery is the same voltage as that in the A700 (and pretty well any other DSLR battery as it’s dictated by the electro-chemistry). Precisely the same charger works for it and the A100 battery (including non-Sony generic chargers). If you do modify a battery to make it fit the A700 then it powers it up – it’s just the camera refuses to work and tells you politely that it’s not an Infolithium battery. Frankly if it powers up that far, it will work the camera. I doubt you’ll find a qualified electronics engineer anywhere who wouldn’t come to the conclusion that this was a deliberate policy by Sony – it would be a trivial job to be able to recognise a non-Infolithium battery and just forgo the advanced capacity monitoring. That’s all Infolithium is – a chip which monitors the cumulative discharge (and charge) of the battery. It’s probably got an encrypted interface of some sort to make reverse-engineering difficult. If anybody thinks that is unlikely, then the inkjet market provides an example where this practice is rife. Manufacturers deliberately put chips in cartridges to make it very difficult to replicate. The older Canon I’ve got has no problems like that – the chips on modern cartridges add very little to functionality. I’m just glad that CF is so well embedded in the market that even Sony won’t equip their DSLRs with memory stick alone. I just upgraded from an a100 to an a700 and learned about the battery issue after the fact. With my older a100 instead of buying the Sony batteries I bought the generics off ebay. I bought three generics, and had my stock sony battery. The stock sony battery has been reliable. 2 of the 3 generics will no longer charge. The charger just gives me a flashing light when I put them in. I need batteries for my a700. But I am concerned that the generics will have the same issue as the ones I got for my a100. Can someone please tell me if the generic a700 batteries available on ebay work? By the way the A700 is awesome. About the testing data. Was he using a flash in those shots? I know the flash can eat up the battery fast. If he wasn’t using the flash then getting that many shots off a single battery is very possible. You can buy Sony brand batteries for the a700 for around 45 from Amazon, cheaper if you buy from a non Amazon dealer through Amazon. Thanks for the great review on the A700 battery life. I recently purchased this TV and have had problems with battery life. However on ebay I purchased some spare batteries and they seem to have solved the problem temporarily. I have a feeling these batteries will not last and I would have been better off buying spare batteries from Sony directly. Thanks for the great info in your post, it was really helpful. Even the amateur can find the web internet site of the particular organization in which he is interested and can collect the required info. The stock broker can guide the newbie within the present situation of stock exchange and may give some predictions and ideas about next few days of trading trends. As the stock exchange is not steady, the new investor need to watch some swings and roundabouts and try and research them making use of the study strategies they’ve picked up thus far.